I was born a sickly foal. It took me 2 weeks to learn how to run. Two days to learn how to stand. 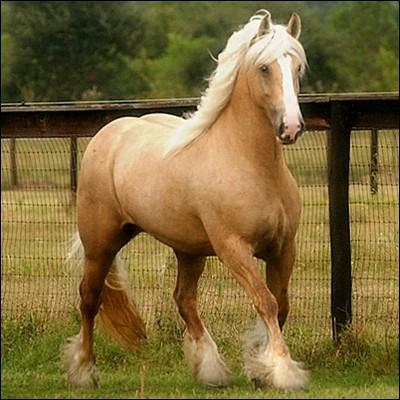 My mother was a strong mare. I loved her. 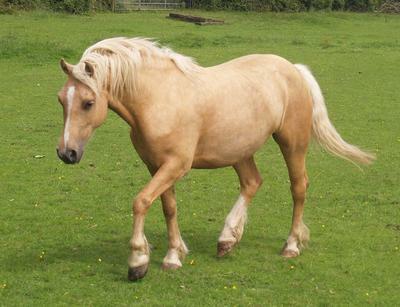 She was a dark palomino Clydesdale. My father was a strong mustang who I never saw. I only imagine him looking strong. He was taken away right after my birth, I never saw him. I didn't have any friends. I hated that. They all thought I was to weak to play with. I'd watch secretly behind the trees to see them play and buck at the colts. I wanted to do that to. At two years of age my herd excepted me as who I am. There was one problem about me and that was curiosity. One day while my herd was grazing I wondered off into the woods. That is when my life turned upside down. I was looking for a tree that produces apples, I only wanted to show my herd I am not useless. I heard this growling. I froze. I whinnied and heard a faint whinny in the distance. I looked all around wondering what the noise was. Then, I found it. Wolves jumped out of the trees and surrounded me. I froze in fear, one whinny and I'll be gone. I took my chances. I whinnied. They jumped at me one giving me a huge cut from my leg to my neck. I whinny in pain. It tortures me. The last thing I saw before I blacked out was the voices of the other two legged coming toward me. I blacked out. I lay there waiting. For something. Anything. I lift my head up to hear the sound of another horse whinnying. I hear whipping and yelling of not horses but other creatures. Then, I hear it dreadfully scream for its life. And then I hear a drop on the ground. One that makes me think its dead. Whatever it was its dead. I slowly put my head down. I see them coming. My death. Torture and pain. They have had a bite, now they want more. They race toward me. Not knowing what to do, I whinny and whinny. I want something to hear me before THEY get me. THEY are terrible. I quickly try to get on my long jagged feet. But I can't. I fall immediately. They are creeping toward me. One lunges at me as soon as it touches me I have a flash back. The painful sharp teeth of, of THEM. I feel claws rip my skin. I hear the yelling of the creatures again, then I blackout. I find myself in a very box like carriage that has wheels. I was frightened. I pound my hoofs on the box hoping it will budge. No. Not a chance. I plop onto the box as my eyes slowly drift closed, I sleep. I wake up as the box comes to a stop. These creatures my herd call two leggeds walk up to me. "OWW!" I yell as they poke something into my chest. Next thing I knew I was asleep. I wake up finding myself locked up in another box with food and water. This food is much better than grass. I love it. I am chugging down as much as I can when I feel my legs and how much pain they are in. I try to roll, thinking it will make me feel better. But as I twist my body around I scornfully scream at how much pain it was and how I don't want to get back up. I lay there trying to get some of that delicious food, but all I get is some nasty taste of wood and a few slivers in my tongue. I see a bunch of two leggeds walk in. I look back and startle myself by seeing a huge scar were THEY scrapped me. It went from my leg to my neck. I stared hopefully at the two leggeds that they can help me. HEAL me. They carefully wrap my leg. It was damaged the most. They slowly whisper to each other, "The wolves got her bad, she won't be able to train for a few weeks." The other just nodded. I don't feel alone anymore. These two leggeds were nice. "Hey," I said "what are you doing?" I twisted my head around. They whispered "Easy girl we ain't gonna hurt ya." I thought that meant its okay everything's okay. I don't totally trust them. They did poke me with something really weird. I let them work on me. Pretty soon I could gallop again. I ran out into the pasture with delight. I loved the wind in my face. Suddenly, something jerked on my neck and made me stop. "Hey!" I yelled as I pushed my hoofs into the ground so they couldn't pull me. They pulled a long pointy stick out, raised it above their heads and slapped me with it. I bucked "Hey!" They raised it above their head again. "Fine fine fine!" I said. I walked with them. They had total control of me. They led me to a box. I got brushed and they took all the dirt out of my hoofs. If felt weird. Having a halter on your mouth is weird, they can lead you everywhere. I HATED it. I bucked and reared as much as I could. I looked at the other horses as they told each other, "She is never gonna be trained. Trained? What does that mean? I decided I wanted to know, so I obeyed. The training began. Please give me notes if you are reading this so I have a reason to keep writing sorry it took so long to write the next one, enjoy! I didn't want to give in truthfully, but i was full of wonder and I dreaded having a wonderful chance passed up. So I gave in. I was still in the box looking thing and gobbling down as much as the food they gave me as possible. I was still in the box when this little two legged that looked at the age of eight came up too me and said, "Come here um let me think, Sugar." Sugar? Is that me? Well I am going to find out. I nickered. She laughed. "Ya, my daddy is wrong, you can be trained. Huh sugar." I nickered and walked up to her. She is sweet, and kind. Not like the other two leggeds. "My name is Cathy, but my dad calls me cat." Cat. I thought, "Cat is wonderful." I nickered again and smelt some food. I pushed her pocket. "Hey, hey! I was gonna give that to another horse!" I put my head down, bumping the box. "Fine, here you go!" she gave it to me. This tasted much better than the other food. "Funny horse, it is a carrot." "Your amazing it is like your a human I can see your feelings." Human, so that is what they are called. She started putting her hand toward me. I remembered what that did last time. I rapidly swung my head back and forth afraid. I backed up afraid of what she might do. She looked at me tears streaming down her face. Cat ran away. I nickered calling for her over and over again. I heard her crying to the older humans saying, "She is just upset, she has been treated wrong." She ran back to me saying, "Please sugar, show them your different." She came back about 3 hours later. "Let's try this again." She gently spoke comforting me she put her hand on me. First I was startled I put one foot back to be careful. She gently said, "Good girl." She practiced that with me for days. A week later she came in saying, "We are going to try something new okay." I nickered. "Move cat, I need this horse." I heard a bigger voice and backed away. I heard cat crying, "No, don't take her please!" He tried to put this odd looking thing on my face, I refused throwing my head up. He hit me with a sharp looking thing. I felt pain and blood flowing down my neck. I shoot right up to him letting him do what he wanted. He put this odd looking thing on my face and pulled on it. I dug my hoofs in the ground terrified of what he'll do next. "I heard cat say,"Please please stop, she doesn't like the whip!" He hit me with it again. I felt more pain and launched myself forward. Limping on my way out. He made me trot around him in the circle. Every time he raised what Cat called the whip, I shoot forward I saw other humans laughing and talking in their language. I didn't bother to listen. But every time I looked that way he hit me again with the whip. He groaned and hit me harder with the whip. I reared, hitting him on my way up. I heard Cat call, "No!" I knew I did something wrong. I trotted over to Cat. She took the thing on my face and lead me to the box again. I'll follow her. Not those other two-leggeds. I love her. I TRUST her. I didn't see Cat for weeks. I thought I'd never see her again. She finally came to my box. She grabbed my thing on my head that she calls a halter and lead me to a place with more gates. I whinnied terrified of what happened last time. And dug my hoofs into the ground. "It is okay Sugar. I am with you remember, me Cat." She said calmly. I hesitated, but then went into the gate with her. Thank you. I thought. For coming back to my box. I nickered to Cat. She started to walk me in a circle. I knew I could trust her. After all we have been through, I trust her a lot. She started making noises with her mouth. I think that means stop. So I stopped. She kept making the noise, I started walking again and speeded up to a trot. "That's it!" She said cheerfully. "Good girl, I'll show my Dad in the morning." She brought me back to my box and gave me really good food. Once I was done I felt my eyes closing. Next thing I know. I was asleep. The next day Cat woke me up early by putting food in my box. I ate it all up. She put the halter on and brought me out again. I saw the man who whipped me and had a deep voice. I dug my heels into the ground, calling to Cat I don't like him. Cat pleaded, "Please, for me!" I stayed put. The man had a whip in his hand. I saw it and burst forward. Cat took me into the place with gates. I started walking and almost fell to the ground with fear. She started making noises and I rapidly shook my head, tearing the halter rope out of Cats hand. She fell. I heard the man with a deep voice who whipped me come near. I ran to my box. One of the other humans came and shut my box I cowardly stood in the corner. I found Cat running to my box the next day. She opened the gate and threw her arms around my neck. "I am so sorry!" She cried. "I never knew he would put you down for that!" I didn't understand. What does put down mean. Did I do something wrong. Cat was there crying into my neck and I had no idea what she was talking about. She gasped and calmed herself down. Her voice still sounded like she was crying when she said, "I still have time. I just have to show you there is nothing to be afraid of." she took my lead rope and brought me to the outside again. I did exactly what she told me to do. "I don't understand, you work perfectly with me but when my dad is there you don't move a muscle." She shook her head sorrowfully. She took me in close and lay on my back. I looked at her and she whispered, "Listen, if you don't act up when my dad checks you one more time to make sure you are worth killing," I knew what that meant. Killing. He wants to kill me. Why? she continued,"you wont be killed so please." Before she could finish she burst into tears. she said in a shaken voice, "I love you Sugar!" she whispered again, "I love you!" she straightened herself up and looked for ward. She started walking to my box. She gave me more food, she stayed by the whole time. When I was done it was dark outside. Cat gave me one more kiss and left for the night. She came back in the morning and put the halter on me. I knew what was coming. I had to get this right or I was to be killed. Cat lead me outside. The weather was warm and sunny I looked around anxiously wondering if I was to see Cathy's dad. I darted my head back and forth and finally found him. I moved sharply. I was scared. Cat brought me onto the fenced place and started me in a walk. I looked at her and found a whip is her hand. I reared. Cat fell to the ground slapping me with the whip on her way down. I jumped the fence and ran off into the dark forest. I heard hoofbeats behind me. I stumbled and the other horse caught me. I was lead back into my box. I woke up the next morning sore all over Cat hadn't come for the last two days. I found food in my box and walked over to it. As I ate I looked at the weather outside. Raining. All damp. I t reminded me of the way Cat's dad treated me. I found Cat walking toward me and nickered. She looked at me, tears streaming down her face. She got my halter and lead me out of my box. Her father came in, I stiffened. He lead me into the same box that brought me here. I wouldn't dare go in. Her father took out his whip and slapped me. I lunged forward almost ripping the lead rope out of his hands. I was loaded into the box. It started moving. Cat was balling behind me yelling, "Please! Don't take her." That's all I saw before it was the forest terrain all around me. I didn't know what to do. I called for Cathy several times but I didn't hear anything in return. I paced around in the box wondering what to do. I was trotting around in circles when the box came to a stop. The man that was driving it came out. cursing as he came out. I backed to the corner of the box. He came in and had a halter in his hands. He ruffly put it on me and put a long lead rope on. He walked me out and grabbed his whip. I froze. I was surrounded by gates again and many people were surrounding me. I didn't move an inch. The man hit me with the whip and I burst forward. The people looked at me and said something I didn't listen I was looking for Cathy. "Cathy!" I called over and over. The man whipped me and made me listen. He started whipping me again making me canter. I felt blood and pain all around me My legs were aching and I felt like I was going to fall over and die. Finally, it was over. The man brought me over to the box but I refused to go in. He whipped me once more I tripped over the box and fell. The man shut the door fast and drove fast talking saying, "I need a horse vet, fast." "Yes I think it is her cannon bone." "Okay bye." I felt myself dozing away at sleep, no longer in this horrible world. I was surrounded by darkness. I felt so much pain. I longed to see Cathy. Oh, how I wanted to see her smile. Her red beautiful mane. I longed to see her brown wonderful eyes. How I missed being with her. Her kindness I missed the most. How she never used the whip. How I wanted to be with her all the time show the other horses I love her And I can be trained. Whatever that means. I think I figured it out now, she wants to work together as a team maybe be like another horse to me and play with each other. That would be nice. i felt a shock on my leg and woke up. i was in a place with more people. I looked around. Then I found her. Her red mane, her brown eyes, her kindness, I found Cathy. I see her Cathy, I didn't know what to do I was to weak to do anything. I just lay down. Then, I realize whats going on. I cant get up. My cannon bone hurts so bad and i can't move it. I whinny as I see Cathy walking towards me. I couldn't take it anymore. I flew up into the air rearing. I fell back down hurting myself even worse. I see Cathy walking away terror in her heart. i whinny calling her name. Her father gets grip of her and pulls her arm. 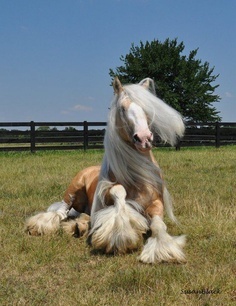 Her body fell her long beautiful mane falling on the ground. She picks up her feet and runs over to me pushing the people around me out of her way. Then, she found me. I see her running toward me. I try to stand up and fall down again. "We are going to bring you home and make you all better." she whispers as tears gently flow down her freckled face. i see her father running toward her his face red. "Cathy!" He yells violently, "Get over here you little ugly!" he grabbed her arms yanking her away, I whinny for her to come back. I see her thrown onto the ground by her father. I couldn't take it. 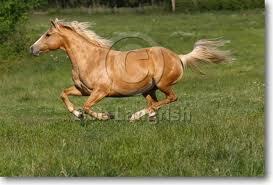 I burst up and trotted toward her. I saw her smile before she blacked out. I am now in another box. The same one I was in when I hurt my leg. But i didn't move a muscle. After Cathy was taken away, they loaded me into the box. I felt it come to a stop. As the door opens, I see my home again. Where all my memories are. At that moment I froze, i don't even remember who my mom is. or anyone I use to know. Then I see a human coming. he put me in my normal box and walked away. i saw Cathy running over. tears streaming down her face. She swung my box open and collapsed on me. She spooked me a little and I jumped. She whispered, "My dad, I love him its just he is drunk and he treats me badly." I see a man standing by my box hidden so Cathy wont see him. Then I recognize him. It was Cathy's dad. Sorry it took so long. I hope you like this. I would also like to thank Alex (The author of in a moment) To inspire me to write this. Thank you Alex. This one is really good! I whinny at Cathy telling her he is there. Then I have a flash back. I see the wolves face as it slowly turns around twisting as it transforms into Cathys Dad's face. Then I realize. He needs to leave. He hurt Cathy. But Cathy loves him. He just needs a little fixing. I nuzzle cathy and realize he is coming she gasps and hides on the ground by my feet. He passes by and Cathy sighs. "We are going to try something a little new. She brought a hand whip out of her bag. I reared and started pacing around the gates. She ran out of my way. Suddenly out of no where a horse ran lose. Cathy dropped the whip and ran up to me. She whispered to me, "Sugar listen that horse is a famous jumper. We need to catch it." She slowly got on my back moving carefully. "Move to the fence. I walked toward it. She opened it and yelled, "Hyah!" I ran as fast as I could." She stayed on perfectly and helped me run. She waved something around in the air. 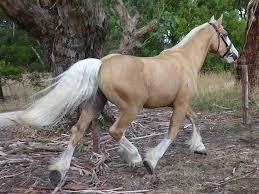 Suddenly, I had a flash back, I was in the pasture running and horses with men on their backs. They caught me with that rope. I was in the real world now I know what she wants now. This is what we are meant to be. "Come on Sugar faster!" I ran as fast as I could changing strides and picking up the pace. She caught the horse it whinnied and said, "That was fun..." It said something else but I was deep in thought. We were meant to be together this whole time. I turned my head walking now and nibbled on Cathys shoe. Her smile was wider than my face. She said, " I felt like I was on a horse that had already been trained." She laughed and said, "Lets get you home, and you Buddy. " She said to the other horse. When we got home she gave me food and brushed me while she talked. I listened like I always do. She gave me more food kissed my nose and walked out for the night. I went to sleep ** The next day she came nice and early I nickered and nudged her. She gave me food and talked. She took me out to graze a bit and tryed to run away from me but I always caught her. We both lay down exahsted and fell asleep. I woke up with Cathy and softy nickered. She woke up and said, "Oh gosh we should get back to the barn. Then I decided I want her to get on me again. So I waved my head toward my back and whinnied. She looked confuse and tried to bring me with her. "No Get on my back!" I thought in my head. Finally she slowly got next to my back and I gave her a boost with my head. I loved her on my back. I trust her it is just, well, sometimes I forget. She started making the noise to speed up. I stared walking. Then she did it again and I trotted. Soon we were at a gallop and heading home. I was in my stall now eating hay but this time it was a different kind. It didn't taste like the normal hay it kinda tasted like grass. I began to realize that I have gotten skinnier and skinnier. I looked at my scar. "At least this is healing." I thought in my head. I looked over the stall door and saw all the other horses sleeping. I dozed off a couple of times while eating hay. It was half way gone before I fell asleep. I woke up. I looked around my stomach hurt and I felt like rolling all over. I saw blurry stuff everywhere. I tried to eat but didn't feel like it. Then I couldn't take it I collapsed on the ground and started breathing heavily. I was sweating like crazy and didn't even notice Cathy run into my stall and run out. I wonder why she didn't stay. I wish she did. I felt sick. I saw her run in with something she was holding and started talking she said, "Hello. Yes this is Oak wood stables I have a horse with colic. I need a vet Quick." Then I blacked out. I had a strange dream. It was frightening too. I dreamed that Cathy died. Her father became my owner and I was tortured and was killed. I woke up with Cathy on my belly crying. I whinnied. She cried even more. "Please Dad. PLEASE!" She cried harder. I was stabbed with a shot and put to sleep. I dreamed again me and Cathy she was on my back riding and I was running. Free. I saw a thunder storm above me as I ran and Cathy told me to go home it started raining and I slipped and fell on Cathy she didn't make a noise I cried for someone to come. "PLEASE SAVE HER!" I yelled into the wind. Then I heard the speaking of two leggeds. "It will cost you 5,000." One said. I woke up. Cathy's dad nodded and said, "Fine, but Cathy when you have 5000 dollars you pay me back understand." Cathy nodded and ran to hug her dad. He hugged her and talked to the vet. "It will have to be paid off in two no three months." Cathy's dad nodded. "Thank you Dave." The vet said. So Dave. That is his name. I'm so sorry this took SOOOOOOO long! I will try to type this story more often. Cathy lead me out of the vets office. We walked into the trailer and i gently walked in. She shut the door and went into the big thing that was carrying me. I stay put and slowly fell asleep. I woke up to Cathy words, "Get up sleepy head." I opened my eyes. Cathy was pulling me into my own box. I followed her into it and she gave me some food. I nickered softly and started eating. As i ate i thought about tomorrow. I want her to ride me again. It felt so good to have her on my back. 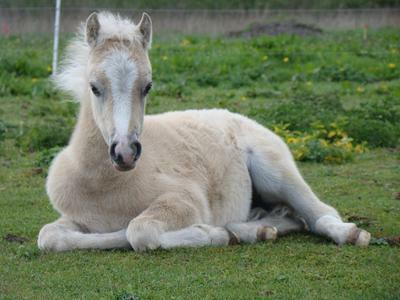 I fell asleep after i had eaten all my hay. I woke up again to Cathy yelling at her dad,"What do you mean your selling him!" she yelled. "I don't have enough money to keep him here. 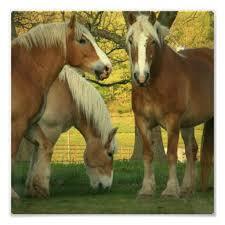 I'm sorry Cath but, I can barely pay for Sugars surgery and have enough to feed all the horses." Cathy grunted and ran to my box. I whinnied. "Come on sugar." She lead me out of the box and tied me up to a pole. She left and came back with the things she used to ride me. I snorted. She laughed and said, "Your excited aren't you!?" She laughed again and swung the things onto my back. She untied me and got on. I nickered and she urged me forward. I broke into a trot but she slowed me down into a walk. I threw my head telling her I want to run! She said nope, we are walking. Soon enough she gave up and trotted me. WEEEEE! I thought I love trotting. All of a sudden a mountain lion came out of the bushes I reared and tried to run. I ran far back and then, I noticed, Cathy wasn't on my back. "Cathy!" I whinnied. "Cathy!" I whinnied louder. I heard a scream. I ran to the direction I heard it. I looked around, everywhere. I had to find her. She was the only two legged that understands me. Suddenly, I tripped on a root and tumbled down a deep hill. I tried to get up on my feet. It took me a while but, I finally did it. Then I found Cathy running for her life, literally. I ran to her and when she saw me she looked over she had blood running down her face but not anything to bad. Her clothes were ripped and a little bit of her mane had blood. I knelt down quickly so she could get on. She quickly responded and jumped on my back. I waited a little for her to ready herself, then burst forward. Cathy was crying. I kept my head forward looking down and up at the same time. She noticed how I was struggling and took lead. I kept running still. She even urged me faster and I obeyed. I wanted to out run this cat as much as she did. 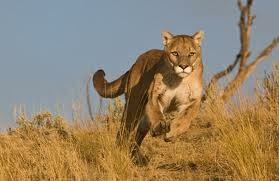 The mountain lion was gaining on us, and I was running out of breathe. Suddenly, Cathy changed my head position and I saw the farm. I was filled with hope again and gained speed. I aimed toward the fence. Cathy gasped with surprise and got ready to jump. I got ready to. One stride, two stride, one more and JUMP! We made it. The mountain lion growled loudly and ran back into the woods. Cathy rode me into the barn. She trotted me again. 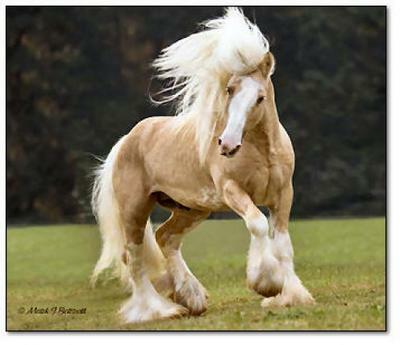 I love trotting. We got into the barn and she said, "I'll get you some hay, after what you did today, you deserve it!" She ran into the tack room with 2 flakes of hay. I whinnied, then snorted. She laughed. "I'm gonna go clean up, you eat your hay." I snorted again with a mouthful of hay, it flew everywhere. "Dad! Dad!" Cathy ran toward the house, her clothes ripped and blood stained. "Dad! You'll never believe what sugar just did!" Her Dad ran out from the barn. "What the heck did that horse do to you!" He yelled at me. Cathy ran up to him, out of breath. "She..." she swallowed, cooling her dry throat. "She jumped over the fence!" Her father froze. "And you fell of?" He asked almost like he knew. "No something worse. She continued, "There was a mountain lion and it came up to me and sugar, sugar reared and I fell off. The mountain lion slowly came up to me, and it attacked me while I ran. I fell out of breath and sugar came to save me. She knelt down so I could get on her! 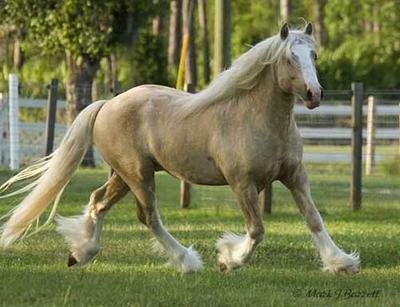 She is like a fantasy horse! She took me home with the mountain lion chasing after us and she jumped the fence! She's amazing dad! May bee if I train her more i could-" "No!" My dad said, "I cant take any more chances!" He said rubbing his head, "Just take a look at yourself." She stared sadly at her body. She stood firm, "I don't care what you say because last time you said that I couldn't keep her, well, just look at her now! She is a better friend than anyone I've met." She walked to the barn. I nickered in her presence. She just looked at me with a gentle smile. She left to get those things that go on my back. "This is an English saddle." She said holding a smaller one than the other one I had. She set it on my back. I whinnied loudly happy to go riding. Cathy smiled wider. "Lets show my dad what we can do!" I was confused. What are we going to do? She ran back to the tack room and took out the thing that goes on my head. She said, "This is a bridle." I got it. A bridle, I have to remember that. She put the stuff on and brought me out to the fences. Their was a bunch of fences she called, "Jumps." I got into the place with the jumps. I felt the pressure of her heels and walked forward. I was use to this. After a couple of minutes she pushed me into a canter. We circled around the place, filling the air with sand. Then, she aimed me toward I jump. She was nudging me faster! "No! Your going to fast!" She pushed me faster, I didn't go any faster, I couldn't. Finally she kicked me hard enough I had to go fast. But I couldn't. We ran up to the fence and I didn't have another choice but to stop. I stopped in front of the jump. Cathy flew over my head landing in the dirt. She didn't move.